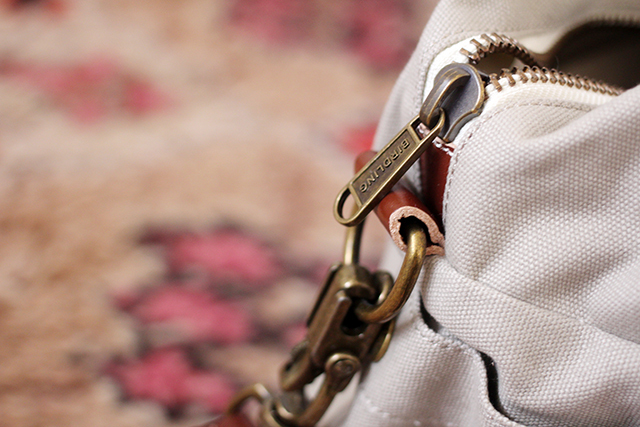 First, you'll want a big bag with some inner pockets. 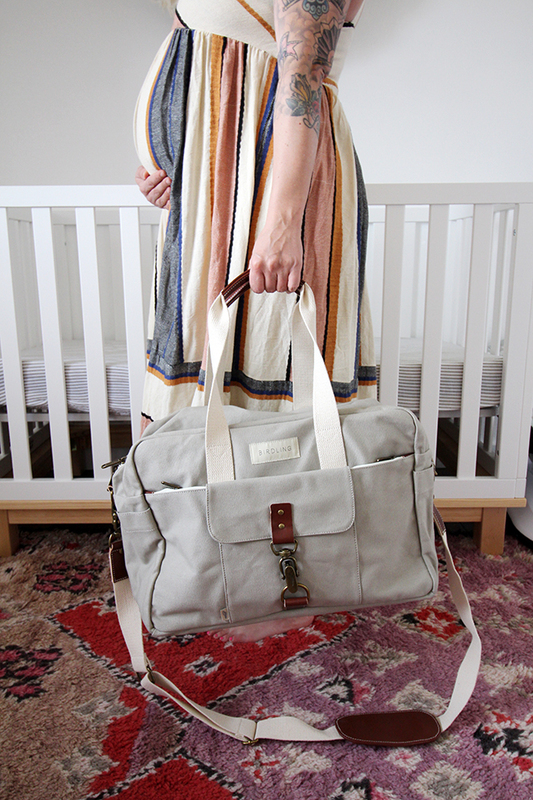 If you got a new diaper bag for baby, that's always a great option. 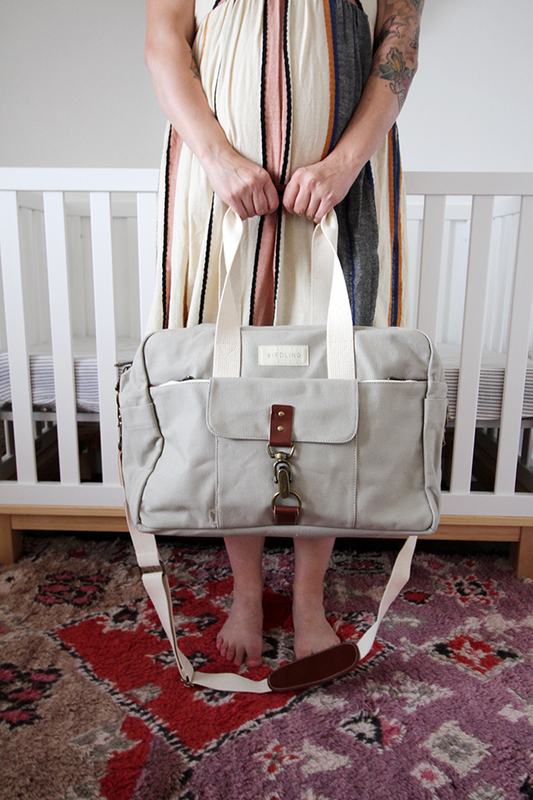 You don't need anything fancy, a good old duffle bag or even a small rolling suitcase will do. I have been using Birdling Bags while traveling for years (and brought one along as Charlie's hospital bag! ), and I was so excited when they sent me over a new grey one to bring to the hospital with Olive. It's upgraded, with some new features, and I can't tell you enough- it's SO worth the price. I've had my green one travel all over the place with me and it still looks brand new. They're made in the USA and their craftsmanship is really fantastic. I prefer the Overnighter- it's the perfect size and holds everything I need for a weekend, and was the perfect size for my two-night hospital stay. Also please be sure to check with your hospital/birthing center to see what they provide before packing. Ours provides almost everything, but I think it's a great idea to check in to be sure of what will be on hand for you and your little one. Wallet- Be sure to have your insurance card and license, and that your partner also brings along his/hers as well. Toiletries- I brought body soap, lotion, face wash, face lotion and eye cream. No need for makeup unless it makes you feel good to apply it while there (by all means do what feels good to you! ), and I didn't bring shampoo or conditioner because I washed my hair the morning of my surgery and just brought along dry shampoo. Extra long iPhone cable or portable charger- My new iPhone 7 holds an insane charge, but this was an issue with my previous births- the cord wouldn't reach the bed! Sounds like a silly problem to have and the least of your worries, but being stuck in the hospital for three days is made better when you can connect with the people you love AND take a ton of photos of you and your new baby. Don't forget to clear off your phone/back it up before you come to the hospital so you don't have to worry about making space for all of the new photos you're bound to take. A filing folder- You'll be getting some special things like baby's footprints on a card, their birth info card, hospital bracelets...and you'll want someplace safe to store these without them getting bent or torn on the way home. They're really great keepsakes for the baby book so I like to tuck them away in a safe spot. Your "Going Home" Outfit- Being a c-section mama, I needed dark-colored, high waisted, loose type pants that would be gentle on my incision. Palazzo or gaucho pants with a smocked waist are perfect. Pair them with a nursing bra (my milk comes in pretty early so a supportive nursing bra from the get-go is KEY for me- I linked two of my faves), a loose tee and maybe a comfy cardigan. My shoes have always fit coming home, but I know some women's feet really swell (mine always seem to wait until I'm at home), so keep that in mind when choosing shoes. I wore these Birkenstocks. Snacks- I brought along protein bars, apple and bananas. Our hospital has a cafeteria with delivery, but I liked having quick grab, healthy things on hand too. A readiness to say NO (if you want to)! I wanted to mention this here. Each time I've given birth, well-meaning people come in and will ask certain things of you and baby- like if you would like to publish your little one's picture and info in the paper, take some free portraits with the hospital photographer, whatever. I remember feeling overwhelmed the first time I gave birth, and I said yes to things I didn't want to say yes to! This time I was happy to say no- no to the newspaper photo, no to the free photo session (Where do the originals of these photos end up anyway? Do they retain the rights? ), no to the hospital chaplain praying over my baby, no to support services following up every week with a check in call. Don't feel bad saying no, mama. You do what's right for you and YOUR little one. Robe- Another "extra" item I wasn't sure I would actually use, but I would put this robe on over my pajamas when we had visitors. I was there for three days so I enjoyed having these little bits of home with me, and I am continuing to wear the robe now. Easy to feed baby if you're nursing, a nice comfy layer, and just a very cute loungey thing to throw on for visitors at the hospital or in those early days. Nursing pillow- I have brought along a nursing pillow for each birth and have always loved using it. It saves your back and neck, and just makes things more comfortable whether you're feeding in bed or in a chair. If you're not nursing, this can also be used by you or your partner for easier bottle feeding! Slippers- I do not bring along slippers, but I know many women do like having their special pair from home. I personally don't like to bring home any germs from the hospital floor so I keep my slippers at home and instead wear the Totes-like slipper/socks they provide so I can throw them away when I'm done. Water bottle- The hospital will most likely provide you with the mama trophy, a big plastic jug with a bendy straw! I loved this thing, and especially love it now that my water bottle of choice is a heavy Hydroflask that feels dangerous drinking over nursing Olive's head! Carseat- You cannot leave the hospital without it! 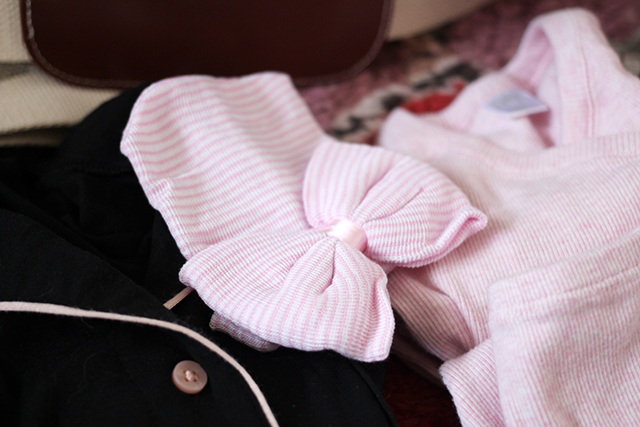 Baby's "Going Home" outfit- Bring this in MULTIPLE sizes! I brought two sizes, because I just wasn't sure what size Olive would be. With the boys I always brought the Newborn size, and 0-3 just in case. I'm not sure why, but with Olive I thought to bring along the Preemie size (up to 7lbs) just in case and I'm so glad I did. She's a little peanut, born at 7lb 2oz and dropping down a bit after birth. She was swimming in the newborn size and the preemie was almost too big also. I was thankful I had thought to grab it. And a quick tip- be sure it is a two piece- I find these are easier to manage, especially with a snap-top/kimono style tee. Here's what Olive wore home. A special hat- I knew I wanted a hat with a big bow, which our hospital does not provide. So I ordered this one on Amazon and LOVED it. It was the perfect size, much stretchier than the one the hospital did provide, and a really adorable keepsake. 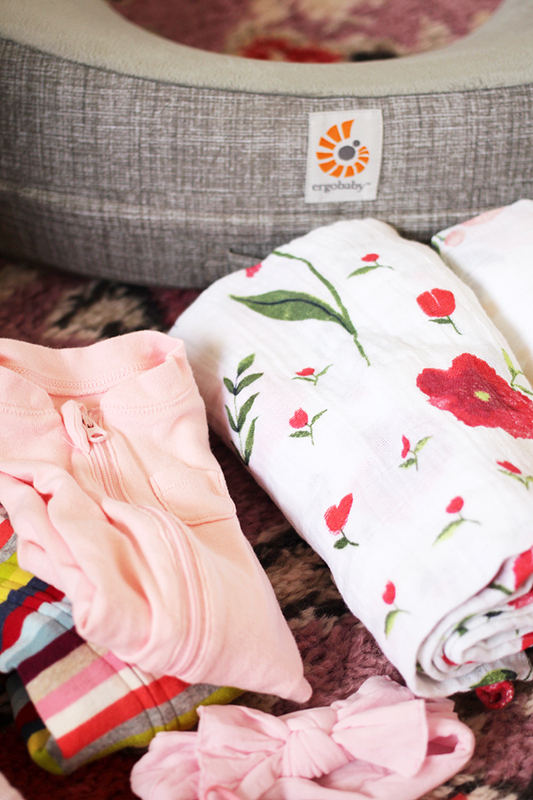 Swaddle blankets- I only used these to take some cute photos in the hospital, so these are a total extra, but I recommend bringing one along just so you have it. The birthing center we delivered at provides blankets, but you cannot take them home, so we also used the swaddle blanket we brought to cover up her legs in her carseat leaving the hospital. 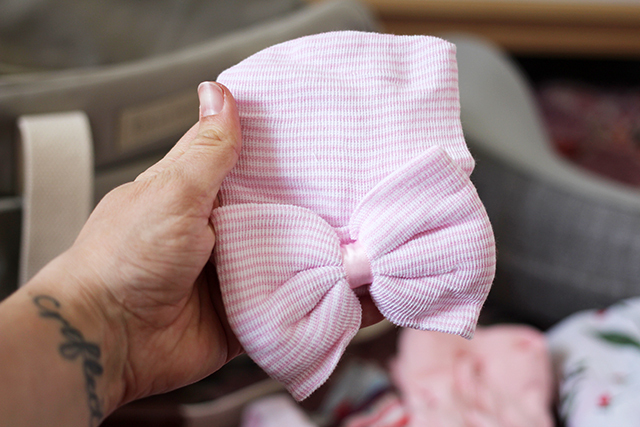 Bows- Being that Olive is our first girl, I knew a tiny little bow would be packed in our bag. She only wore it for a few photos, but I'm glad I had it. 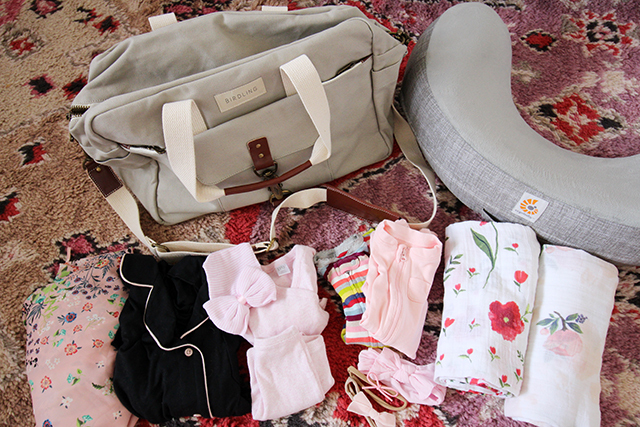 Extra clothing- I always throw 1-2 extra baby outfits in my bag. I didn't use them this time, or the times before, but if you're extra ambitious you may want to dress baby in his or her own clothing. Our hospital provides those handy snap tees, socks, etc., and each of my children just wore those their whole stay until they put their going home clothing on. Diapers and wipes- The hospital will provide these for you, and probably give you some to take home too! Baby bathtime items- The nurses will give baby their first "bath" (more like a wipe down) and you won't give the baby any sort of bath until they are home. Good luck, mamas! Sending you all happy, healthy birthing wishes. Firstly, congratulations on Olive's birth! I'm so looking forward to hearing more about it and about her. But also, I found this post really interesting just because it highlights little differences between maternity hospitals here and where you are, like slippers being pretty much mandatory here ("You don't want to risk standing on something unpleasant") and wipes being pretty much forbidden (water and cotton wool only for newborns - though nobody sticks to that after they take their baby home!). I knew about some bigger differences between the UK and US but hadn't even thought about this kind of thing - I'm surprised how fascinating I found it! Such a great list! I love reading what others found helped them during L&D and afterwards; there's been so many items I've heard of other people bringing that have made me go, "Why didn't I think of that?!" Like the nursing pillow! I didn't think to bring it when I had my oldest but it was a MUST when my youngest was born. And the extra-long power cord! I brought an extension cord along with me because I knew from before that the power outlets are SO far away from the beds. We never brought diapers (the hospital provides those), but I have heard of some hospitals that ask you to bring your own. Oh, and we brought a change of clothes for my husband since he stayed over night with us. And finally - Welcome baby Olive! You're gorgeous just like your momma! I actually told the chaplain no, and she prayed over us anyway. It was the only complaint I had after being in the hospital for a full 48 hours, so it could've been worse!